I’d always thought of Malta as a package-holiday destination; its history and beauty squashed between high-rise hotels. But when I find myself on a quiet patch of the island’s west coast, walking down a gentle slope to the remains of some of the oldest religious sites on earth, I start to change my mind. Hagar Qim and Mnajdra are megalithic temple complexes, hewn from sand-coloured limestone and set near an expanse of Mediterranean blue. Evidence of similarly mysterious sites is scattered across Malta and its little-sister island Gozo, some just unassuming clusters of stones. The earliest temples were built in 3600BC, predating the Egyptian pyramids by nearly a thousand years. 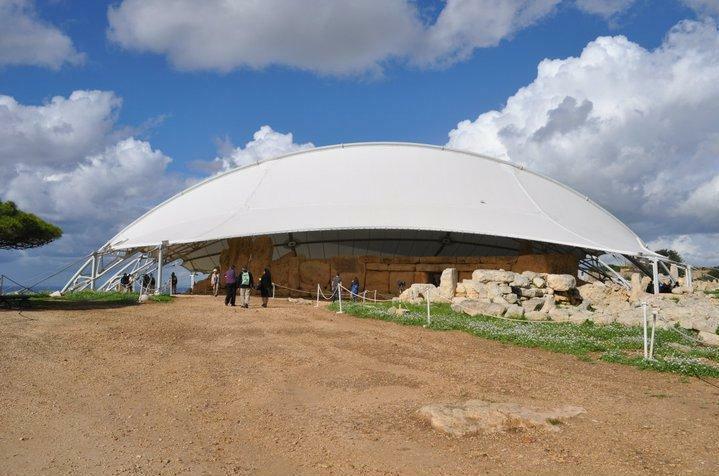 Since their unearthing in 1839-40, Hagar Qim and Mnajdra have suffered damage from wind, rain and sun, as well as rapid changes in temperature. Restoration programmes have brought varied success. The temples’ vulnerable position by the ocean means they are the first sites to be given protective canopies by the EU and Maltese government: cream awnings stretching taut over steel arches. But in the shade of their modern coverings, the weathered stones still resemble altars, benches and annexes, whispering secrets from a time long gone. This is a UNESCO World Heritage site but in late October it almost echoes with a lack of visitors. “Do you think Malta’s tourist industry is making enough of the temples?” I ask Darrell Azzopardi, our guide, as we study one of Hagar Qim’s largest megaliths. It is more than 6m long and thought to weigh 20 tonnes. When conjuring up visions of the temple builders, I understand why Gozo’s best-preserved temple site was named Ggantija, meaning ‘gigantic’ or ‘of the giants’. And what history. Malta’s position at the heart of the Mediterranean means it has been occupied over time by powers that include the Phoenicians, Greeks, Romans, French and British. This island has seen wars and sieges, invasion and bombings, and rule by the romantic-sounding Knights of St John. But today I’m intrigued by what came before; the puzzle of the people who designed and constructed these temples without written language or sophisticated tools. I admire the pitted decoration on what is believed to be the altar stone of Mnajdra’s East Temple. Some astronomers think the marks represent a tally of days between the appearances of certain stars, although this theory is not universally supported. I’m fascinated by the idea that, during equinoxes, the sun rises in perfect alignment to the main axis of the South Temple. During summer and winter solstices it aligns with the door jambs, so only a slither of light can enter inside. I could get swept away in the mysticism, especially when Darrell points to what might have been libation points for offering liquids to the gods. My husband asks whether the holes bored through some of the stones, probably for tethering animals, could in fact have been used for channelling light sources. Then: “Oh no,” he checks himself. “I’ve gone a bit Indiana Jones.” We stare at the holes, laughing, and a lone visitor pauses to look too, one hand twitching over his camera as though something otherworldly is about to happen. The canopies above us caused controversy when they were introduced in 2009, in a conservation and development project costing €4.7m (which included the construction of a visitors’ centre). They are only an interim measure to protect the limestone until a less intrusive method can be found, yet people still complain about the canopies’ visual impact, and of course their expense. I don’t mind the canopies. For me, their sail-like curves sit companionably beside the calmly rolling ocean, and they let in light. The corbelled wall structure hints that the temples may once have had roofs – made from a perishable material such as grass or wood – and so the artificial cover creates atmosphere in the temple rooms, aiding my imagination. While we’re at Mnajdra, the temperature drops suddenly and we hear but don’t feel the pattering of rain. “Well, that’s one very good thing about the canopies!” Darrell says. As we wander back to the visitors’ centre, which was inaugurated in September by Malta’s prime minister Lawrence Gonzi, Darrell talks about Heritage Malta’s plans to create a nature walk at this site. It’s an ideal spot: wild rosemary and Mediterranean thyme are known to spring up from the soft scrubland, alongside dandelions and delightfully named spurge, fleabane and sea squill. This is a home for weasels and wall lizards, while zitting cisticola birds and Sardinian warblers visit to breed. In February and March when cape sorrel is flowering, I’m told the ground is carpeted in yellow. Best of all, on this western coastal edge, there are no high-rise hotels to cast shadows over the island’s prehistoric ‘giants’ and their megalithic legacy. Glancing back at the canopied temples in their idyllic setting, I’m pleased to have changed my mind about Malta.